Families living with Duchenne spend all of their time and resources trying to save their child’s life. For most of them, attending a gala is not a financial or logistical option. At the $35,000 level, you will fully fund families (8 tables) who wish to attend the Gala, to include travel and lodging. 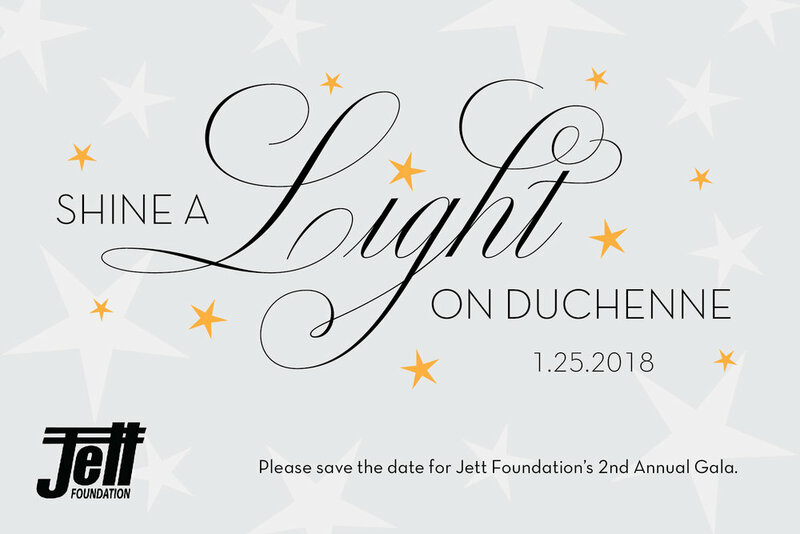 $25,000 provides the Jett Foundation portion of funds towards an accessible van through the Jett Giving Fund; through the Jett Giving Fund, families raise half of the funds towards a van, and Jett Foundation matches the gift when they reach their goal. $15,000 provides a week of camp for a cabin of campers; at Camp Promise young people with neuromuscular disorders are given the chance to experience childhood, joy, freedom, and adventure, while forming lasting relationships with peers and mentors. $10,000 provides an Educational Roundtable where patients and families affected with Duchenne are empowered with the knowledge, education, and support needed to become their own best advocates, to seek out the highest standard of care, the most promising clinical trials and scientific advancements, and the most cutting-edge and innovative treatments. $7,500 provides the Jett Foundation portion of funds towards a stairlift through the Jett Giving Fund; through the Jett Giving Fund, families raise half of the funds towards a stairlift, and Jett Foundation matches the gift when they reach their goal. $5,000 supports a JettRider as they bike 600+ miles across the US to help raise awareness, funds, and to deliver hope to Duchenne families throughout the country. $2,500 provides a campership to Camp Promise to a young person with a neuromuscular disorder. With the exception of the Angel Sponsor, funding examples are provided to illustrate how funds are stewarded by the Jett Foundation to support our young people. Funds raised through the Gala are unrestricted gifts.